My ignorance is this big. This nonsensical comment utterly incensed me. She hasn’t moved on one inch in her understanding of the climate debate. Her robotic response to any challenge to her “faith” in the global warming consensus is the same as it always was. IAN MACDONALD: Is it true that he’s getting $180,000 salary? NAOMI WOODLEY: Harinder Sidhu from the Climate Change Department confirmed that’s roughly what professor Flannery will be paid for working three days a week. IAN MACDONALD: So it’s much more than anyone sitting at this table is getting paid for a seven day a week job. IAN MACDONALD: But you’re providing money to educate the public on their view of climate science and I assume from that in fairness you’ll be providing professor [Bob] Carter and his literally thousands of professional colleagues with similar funding so that they can educate the public on their view on the science. And that, ladies and gentlemen of the jury, is the considered response of the former climate change minister. Is there any more to be said? I don’t think so: res ipsa loquitur. UPDATE 2: Cardinal Pell gets an earful from BoM chief in Senate estimates for daring to express sceptical views. Once again, Ian Macdonald goes to his defence. « Food: the next Green bandwagon? Well I can assure you after reading Wong’s exchange above it’s a contagion. Another one of the “standard answers” from the warmist “bag of tricks;” always used when they’re lost for valid argument, as Wong was above. Another one seen regularly is the breathtakingly irrelevant – “if 98 percent of Doctors said you had cancer”…. That one’s just too easy to discredit. Ms Wong – the only thing flat around here is your career prospects. Just another politician who has destroyed their future prospects by flogging a dead horse. Yet another political scalp on the rapidly enlarging pile of people who destroyed their political capital by trying to push the AGW scare. Just ask Rudd, Garrett, Gore, Brown (UK) and soon to be Bligh, Kenneally, Obama (though he is quietly distancing himself and may pull through) and Gillard. The grand inquisitor Flannery is also busy loading shells and pointing the weapon at his own foot. After the government is done with him he’ll struggle to move his books even from the bargain bin. It is a shame, though, Penny, while being of the standard ALP machine output of trade unionists, workplace lawyers and policy wonks, was actually able to put coherent thoughts together and form a good argument from time to time. But when you lie down with Green policies, your political career contracts gangreen in that it rots and dies. Dead right , If she has so much evidence why does she continue to refuse to produce it ? Because its all based on lies and fraud of the email scandal. [snip – better keep on topic!] Show us your so called scam voodoo science. Even your own carbon modeler Prof Evans says its a scam . Presumably had she been around at the time Wong would have been among the first from the all knowing establishment to apply the denier smear to visionary contrarians (sceptics) like Galileo, Charles Darwin, John Anderson and many others. The most distressing thing is that she is a senator elected by SA voters. No wonder the state is a basket case. Tim Flannery when interviewed for the “Land” 17 Feb pg 29 accused special interest groups of muddying the water. He of course has no vested interest in geothermal and $90 million of government grants. Then again he says 20% renewables by 2020 is inadequate. Penny might do well to check how Tim’s predictions of continued drought is going or how Brisbane would need a desal plant. And they’re in power. God help us. Actually Penny, the government funds people who believe homosexuality is a sin. Watchathinkofthat ? Wongbot – DOES NOT COMPUTE…. Nice to see Plenty Wrong entertaining us again. The cost per ticket is a bit high though. According to he IPCC, 97% of the CO2 that enters the atmosphere is from natural sources (e.g. the oceans) and 3% comes from human activity. 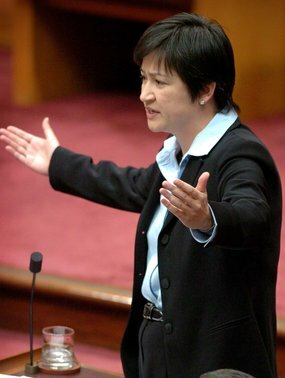 You’ve all heard Penny Wong on the matter… repeating the IPCC mantra about human activity CO2 emissions being so very dangerous to the planet. Well, can Penny Wong tell Australians why it is her belief that only the 3% of CO2 emitted from human activity is so very very dangerous, yet the 97% of CO2 from natural sources is not considered to be dangerous at all? I was curious how the warmists explain away this fact – that the 3% man made CO2 emissions cause warming, while presumably the 97% natural CO2 emissions don’t. Does anyone know? It’s such an obvious inconsistency that they must have some explanation. It is interesting that Dr David Evans working for the Greenhouse Office (now Climate Change Department) thought that the CO2 AGW hypothesis was the “correct” science. When the Vostok Ice Core samples showed that rise in atmospheric CO2 followed the rise in Global Temperature (new evidence), David changed sides. Meanwhile, the real flat earthers, the real deniers clung on to the old falsified hypothesis that CO2 was causing runaway global warming. Penny I’m a bit confused on your take on history. Being that once the pervading unproven scientific view was that the world was indeed “Flat” and all other views were heretical, would not that make the “True Believers” the AGW alarmists of their day. Was’nt Galileo excommunicated by the Scientific/Religious community for his skepticism and opposing views. So…then….given the lesson of history and it’s propensity of repeating itself…be careful, because one day Penny….history will refer to YOU as a 21st Century “Flat Earther”? First up, this blog is run by someone who admits that they are NOT a climate scientist or a climatologist and that “neither is Al Gore”. Well, at least Gore has had his finger on the pulse for nearly 40 years when it comes to the science of climate change, which is more than i can say for the administrator of this blog. Do i believe Gore is totally correct and infallible? No i dont. Secondly, where is your discussion on the unprecedented speed of the increase in the worlds average temperature in comparison to past warming events? Surely that fact warrants some serious debate and discourse. Thirdly, rejecting overwhelming evidence that AGW is happening as a result of carbon emissions is fine, if you can provide evidence to the contrary. Where is your evidence? Where is the irrefutable evidence from many of the high profile deniers come to think of it? And why are Exxon Mobil paying several of these high profile climate change deniers to push THEIR agenda? And he has creamed millions of dollars out of perpetuating the climate scare. He knows nothing about the climate, only how to make a quick buck. His film is riddled with errors, yet he continues to spout misleading propaganda about climate. There is no unprecedented warming in terms of speed or magnitude (unless you only look at the surface temperature record which has been “adjusted” by warmists like James Hansen and Gavin Schmidt). Thirdly, it is for those advocating the massive scaling back of our economies to show that man-made emissions will cause dangerous warming, not the other way round. And then you use the “D-word”, and link us all to Big Oil. What about the $70 bn spent by Big Green? Thats classic neo-liberalism speaking. The idea that economics should be our guiding philosophy and that it is the be all and end all of life as we know it. Is that really your answer for not having to provide evidence refuting the studies of thousands of climatologists the world over??? What of the damaging effects climate change will have on our economies?What about the economic benefits of switching to cleaner energy? What is so frightening about reducing carbon emissions? Why is that such an abhorrent idea to the right? I didnt link you all to Big Oil. I merely stated the fact that Exxon have admitted to funding several individuals, groups and institutions for their climate change (denial) work. And lied about it. Why is that? It would have been interesting to see if the Howard governments carbon trading scheme, which he took to the 2007 election, would have been met with such derision from the right had his government won re-election. You do remember that dont you? Im no fan of the mess that is Labor with their constant backflips and broken promises and am a proud independant, but a quick review of this blog reveals a very obvious anti-Labor anti-Greens stance. To say that it is politically motivated rather than being motivated by “climate madness” as you put it would be an understatement. Neo- liberalism? It’s simply the burden of proof – you talk about “decarbonising” as if it’s something that will be painless and cost nothing. I have no problem with switching to cleaner energy provided that it is competitive, and not propped up by government subsidies, like wind energy or solar. When it is competitive, then people will use it. Plenty of evidence “refuting the studies of thousands of climatologists” is there – like many, you are relying on the argument from authority. More people say x, which means x must be true. Wrong. Nothing is frightening about reducing carbon emissions as you put it, except the cost. It will cause enormous damage to everyone’s way of life, particularly the poorest in society, for no benefit whatsoever – you’re prepared to do that are you? Throwing money away for no benefit seems like a pretty dumb idea to me. We can’t control the climate. Spend the money on adaptation if you want, but wasting it on mitigation. Lastly on this point, if you’re going to reduce pollution, reduce pollution – by which I mean particulates and toxins – carbon dioxide is NOT a pollutant. The money spent by Exxon pales into insignificance compared to the billions of dollars spent by governments to advance the climate change consensus. It’s a total joke to try to make that point. More importantly, why would climate scientists fudge temperature records (“hide the decline”), adjust surface temperature series to make earlier years cooler in order to show greater warming, destroy emails when faced with freedom of information requests and threaten journals that dare publish science that challenges the consensus? Why would that be? If the case for AGW is so strong, why the need for all the skulduggery? And yes, this has become about politics, not because I have made it so, but because the Green/Left axis care so little about people and their welfare and standard of living that they are prepared to tax them out of existence on some foolish crusade to “save the planet”, which just so happens to require massive taxes and yet more regulation (a favourite policy of the political left). The science of the IPCC is politicised and therefore must be fought with political arguments as well as scientific ones. My view has always been that unless the entire planet agrees to reduce carbon emissions it is a pointless exercise and i dont believe that will ever happen so yes, we WILL have to spend money on adaptation. ALOT of money, especially if some of the more serious side effects of climate change come to fruition. I see that you’ve questioned the CSIRO, the bureau of meteorology and many other scientific organisations along with the media, pretty much accusing them all of being part of some vast left-wing conspiracy. Personally i choose to keep an open mind and am willing to hear both sides of the debate. Its just that im not overly convinced by your argument, the climategate emails have been used as definitive proof that AGW is a hoax. If all of the people you have accused of fudging the figures and promoting “alarmist hysteria” are wrong, then id like to see more people go public about it. These people who are being persecuted for publishing journals that challenge the consensus, where are they? who are they? As for your claims that the Left care so little about peoples welfare and tax them to death, well i can think of examples from both sides of politics that prove that they dont always have peoples best interests at heart but thats a completely different argument. You say the science of the IPCC is politicised and needs to be fought with political and scientific arguments. Well, so far ive seen plenty of politicians arguing against them but not many scientists. And i think that you will find that many people DONT think its a joke that Exxon and other multinational fossil fuel companies are paying others to spread their own propaganda. No, I am not a conspiracy theorist, but consensus scientists never, ever, admit to the uncertainties in their projections. All the catastrophic scenarios are based solely on computer models incorporating strong positive feedbacks. Empirical observations do not show such feedbacks. The reality is that a doubling of CO2 would, on its own, add less than a degree to global temperature. Everything else, everything, all the sea level scares, the temperature rises, all the rest, is computer models. Yes, I do think that there are cover-ups and nest-feathering, because there is too much money at stake for this to be a non-problem any more. The investigations into Climategate were an absolute joke – you can read about them on the blogs if you wish. The IPCC was established for the sole purpose of finding evidence to back up a pre-conceived conclusion that man was warming the planet. Look that up too – search for Bert Bolin. Look in my Recommended Reading page for a paper on the history of the IPCC (the history that the mainstream media conveniently forgets). You are entitled not to be convinced by my arguments if you choose. I am not convinced by yours, either, that we should just meekly accept whatever “the scientists” say. We are both entitled to our opinions. If you don’t like mine, then that’s fine by me. In reality, I am probably just as much of a climate agnostic as you are, but I have a background in science and engineering and my antennae start twitching when I see the shocking corruption in the IPCC process or the content of Climategate emails, as it is the antithesis of proper science.